That’s the chant, or perhaps a better term would be war cry, that encouraged, surrounded and lifted up the U.S. national team at the 2014 FIFA World Cup this past summer. Now, I am not normally a sports person. I just don’t watch it. Much of the time, I just don’t care about sports. However, this past summer I decided to watch the World Cup. I ended up learning a lot about the game of soccer, or futbol, as it’s known to everyone who’s not an American. And, surprisingly, I found myself really enjoying it. I liked watching the players pass the ball around the field, especially once I had a basic understanding of the rules. I got excited every time the ball was near the goal. I bit my nails down to practically nothing during extra time and penalty shots. I have to admit, though, that one of my favorite things about the World Cup was the complete absence of commercial breaks during the game. Seriously, that alone makes soccer worth it to me. I cheered and cried and became a fan with a new interest in soccer. And, as I understand it, I’m not alone in that. 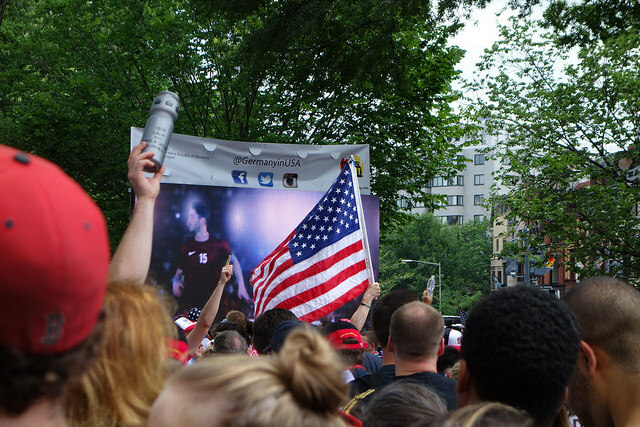 Many Americans, it seems, are steadily becoming more engaged in soccer. One clear mark of this is the support given to the U.S. national team during the world cup. Four years ago, in the last World Cup, the U.S. had lost to Ghana in the group stage, thus failing to make it to the next round. The 2014 FIFA World Cup was different. During the group stage, the U.S. defeated Ghana 2-1, tied 2-2 with Portugal after the other team scored a last minute goal and narrowly lost to Germany 0-1, making it out of the group stage and into the Round of 16. The U.S. nearly made it to the next round but ended up losing 2-1 to Belgium during extra time. Although they did lose later, the U.S. made it out of the group stage, and they didn’t do it alone. The “I believe” chant spread throughout the fans, both the ones in Brazil and those watching from home. There were massive watch parties (just google “2014 FIFA world cup chicago watch party” and look at the images that pop up). For about a month in the middle of the summer, the sport of soccer experienced an immense boost in popularity. Widespread interest on that scale may have died down after the world cup, but it hasn’t disappeared completely, and nor is it going to. Soccer’s been gaining in popularity not only in the U.S. but here in Oklahoma as well. Oklahoma City has a brand new professional men’s soccer team. The Oklahoma City Energy Football Club began its first season in April of 2014. The team is a part of the USL Pro division, which serves as a springboard to MLS for both players and franchises. There are plans for a stadium to be built for the team, but in the meantime the team is based from Bishop McGuinness High School. Soccer seems to be becoming more popular throughout Oklahoma, and in all likelihood the rest of the United States as well. As a brand new fan of the sport, that sounds like great news to me, and I admit I’m eager for others to become fans as well.